The Meadows Museum, at Southern Methodist University in Dallas, houses one of the largest and most comprehensive collections of Spanish art outside of Spain. It includes masterpieces by some of the world's greatest painters: El Greco, Goya, Miró, and Picasso. Highlights of the collection include Renaissance altarpieces, monumental Baroque canvases, exquisite rococo oil sketches, Impressionist landscapes, modernist abstractions, and sculptures by major twentieth-century masters. The museum's collection of art and the galleries for its display were a gift to SMU from Algur Meadows, a prominent Dallas businessman and founder of the General American Oil Company of Texas. The museum occupies a neo-Palladian structure with impressive naturally lit painting galleries and extensive exhibition space. The top row is the entry level; beneath is the upper gallery level. 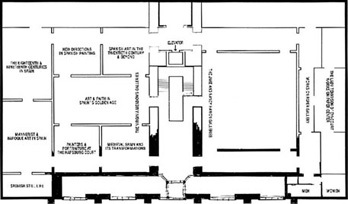 The top plan shows the three entrances, the coat room and the cramped museum store that the visitor must walk through to get to the museum. 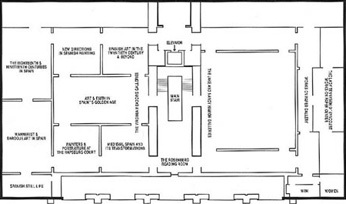 The revised version shows two sheltered entries, each opening into a foyer and then into a grander public space. 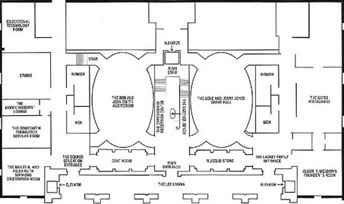 The museum store is in the staircase atrium and the coat room is by the restrooms and the cafe entry. 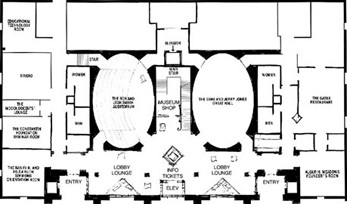 The Lobby Lounge has a central ticket/information desk, seating for museum goers, and a two-story high space. This grand public space can be achieved with no structural compromise - it can be created simply by installing windows within the exterior brick arches. This space also serves as a pre-function and gathering space for users of the Great Hall and the Auditorium.